"PDP Presidential Ticket Shouldn’t Be For A Man With Big Pocket"
The presidential ticket of the Peoples Demoratic Party (PDP) should not be for the highest bidder but for the person with integrity, an aspitant Senator Ahmed Makarfi, said yesterday in Lagos. 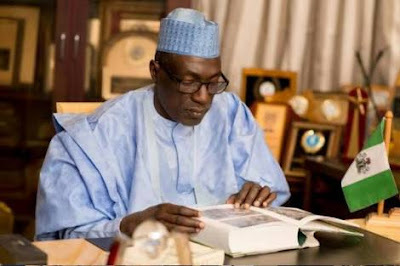 Makarfi said contrary to certain opinions, money would not determine who picks the PDP ticket, and that money had never been a determinant factor in who became the President of Nigeria. He said: “When did Nigeria start to produce Presidents because of resources? Former Presidents Shehu Shagari, Olusegun Obasanjo, Umaru Musa Yar’Adua, Goodluck Jonathan and now Muhammadu Buhari did not become President based on money. Makarfi said he was confident of picking the party’s ticket, according to the News Agency of Nigeria (NAN) report. Makarfi, a former governor of Kaduna State, was Chairman of the PDP National Caretaker Committee. He is one of the 12 presidential aspirants. The PDP aspirant, who has concluded meetings with PDP members in the Southwest, said his exceptional performance as chairman of the caretaker committee would give him an upper hand at the primaries.